Whew! I’m really behind. We traveled over the Thanksgiving holiday for the first time in years, so I am not only behind on blogging, but also decorating. I still have Fall pumpkins all over my house. I am a firm believer in leaving the Fall décor until the day after Thanksgiving, but on that day we were six hours away from home. It was worth it though, as we had a wonderful time visiting my in-laws and spending time with our daughter in her college town. But, now we are “that” house on the block with no lights up yet, or no Christmas tree in the window. Fortunately, my recipe for today is definitely a holiday one and has me in the mood to decorate. Since it is now December 3, I must get a move on. But, first the cookies! I’m invited to a cookie exchange this weekend. I really wanted to do something festive that I haven’t done before. I definitely have some great cookie recipes that are always a go-to, but decided it was time to try something new. I had a “friendsgiving” get together at my house recently so in preparation for the exchange, I made my friends my guinea pigs. I picked this cookie mainly because of its holiday ingredients and appearance. It calls for candy cane “dust.” Doesn’t that just bring visions of Santa’s elves hard at work in the North Pole’s bakery? I also chose these because my son is very much a fan of chocolate, minty-type things. 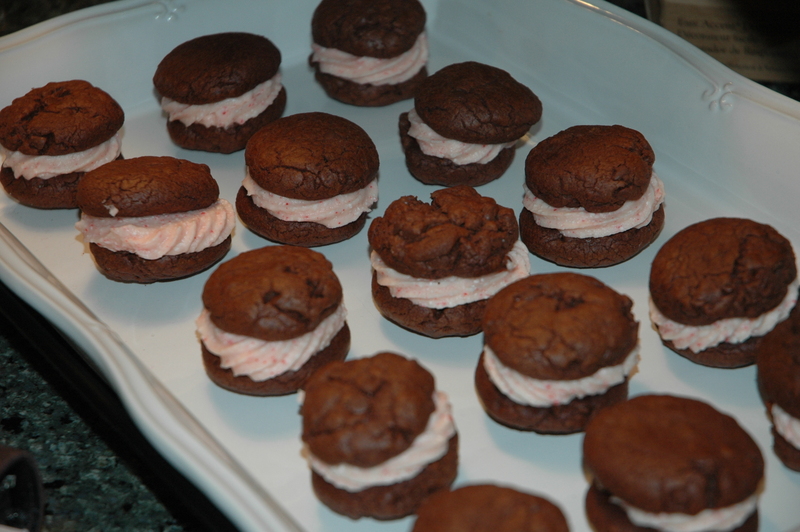 This recipe for Chocolate Fudge Cookies with Candy Cane Buttercream fit the bill. It is definitely minty, and is a very pretty and festive cookie. My photo here really does not do it justice. Its appearance just screams “holiday”. Crushed candy canes give the buttercream frosting that is sandwiched between to chocolate cookies a pink color, with little flecks of red running through. Again, this recipe came courtesy of another blogger, who I think found it from another. You can find the post I got it from HERE. Mix in the beaten egg and vanilla until incorporated. Fold in the mini chocolate chips. Do not overmix. If your buttercream needs to be thicker, add more powdered sugar. If your frosting needs to be thinned out, add remaining milk/cream. I premeasured everything before I began preparing the cookies. I know this makes more mess to clean up, but baking is so much quicker and easier when I do this. I don’t mind washing a few more prep bowls and measuring cups. The original recipe I used called for sifting the ground candy canes before putting them in the butter cream. I did not do this and it was fine. If you pulverize it enough I don’t feel there is a need for the sifting. This is a really, really sweet cookie. Almost too sweet for my taste. I do recommend using the dash of salt in the buttercream to cut some of the sweetness. I did not prepare extra crushed candy canes to “roll” the cookie sandwich in. I think for the exchange I will roughly crush candy canes of a different color, maybe green. I would recommend using a stand mixer with paddle attachment for the cookie dough if you have one. (My Kitchen Aid Professional stand mixer is my pride and joy.) It could certainly be done with a hand mixer, but the dough is really thick and is handled much easier with a stand mixer. All in all, this batch of cookies was a success and I think they will work quite well for the cookie exchange. As I mentioned above, it is a very sweet cookie. Although they are good, one cookie is almost too much for my taste because of the sweetness. I may try making smaller cookies for the exchange. Hopefully by Friday, I will have some handmade tags for the cookie “packages” to share with you. When I premeasure my dry stuff I use a paper plate easier clean up.. That way I can reuse it for the next cookie i make. Wonderful idea. I’ve done that as well. Unfortunately, I don’t often keep paper plates around the house. However, when I have them, I should do this. Thanks for commenting.